I sometimes work in departments other than my home shop. One of the problems I often encounter is needing to do procedures with kit that I’m unfamiliar with. The most recent situation involved doing an ascitic tap. 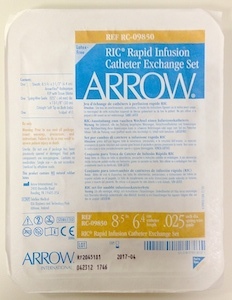 The shop I was working at didn’t have any angiocaths or dedicated paracentesis kits suitable for a timely therapeutic tap. A central line might have done the trick, but have made the frustrating mistake of using a CVC to drain a pleural effusion once; resistance make drainage agonisingly slow. The patient was obese as well as ascites-laden and the longest cannula I could find was 32mm – enough to penetrate the peritoneum (just!) but not long enough to reliably facilitate drainage without outward migration. In the end what I did was wire the cannula and insert a rapid infusion catheter. With its build-in dilator/stiffener it got into the peritoneal cavity easily and drained the ascites at a very respectable rate. The patient found it very comfortable although the hole it left was a bit leaky for a short time afterwards. ← I can’t swallow it!! Nice work Tom… doaway with what you have. .. do you think using a z-track technique would help to avoid the leak? Just a thought. ..
Once I had to resort to a single lumen cvc in a brachial artery in a pathetically overweight 79yo diabetic with two previous cags, heart failure, severely dehydrated man with severe gasro with no BP. His both forearms were manted after harvesting radial arteries were nonexistent. The shop I was in it suspect was the same. There were no femoral lines. Massive pannus would make it impossible to use femoral artery anyway, sexton all in one Arrow were good for nothing – too short for the build. .. he had massive brachial arteries though which saved the day. .. single lumen cvc did a nice job. .. I only advanced it to about five cm into the vessel though. The man was thankful for the care when he left to the big smoke.